An ex-CIA agent leaked the names of other covert operatives to the media, the US justice department said. John Kiriakou is accused of disclosing the names of agents who interrogated a suspected al-Qaeda financier, who was allegedly waterboarded 83 times. Prosecutors say the probe started after lawyers for suspected terrorists filed a legal brief including details not provided by the government. 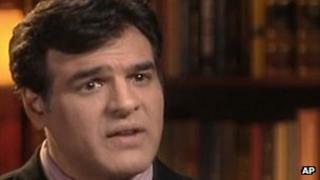 Mr Kiriakou, 47, will appear in court in Alexandria, Virginia, on Monday. He is suspected of leaking classified information to reporters, who in turn provided information to the defence teams of the suspected terrorists. During a recent interview with the FBI, Mr Kiriakou denied releasing the identity of classified agents, according to a sworn affidavit. In particular, Mr Kiriakou was asked whether he released to the New York Times in 2008 the name of an officer who helped interrogation of the suspected al-Qaeda financier, Abu Zubaydah. Mr Kiriakou responded: "Heavens no," according to the affidavit. Information about the interrogation, which took place in 2002, was classified at the time. Mr Zubaydah was detained in Pakistan in 2002 and his case has been used as an example by critics of waterboarding as an interrogation technique. The affidavit also alleges that photographs of the CIA agent who was involved in the interrogations were found in possession of Guantanamo Bay detainees. In 2007, Mr Kiriakou said in an interview with ABC News that waterboarding had been used to break down Mr Zubaydah. He later worked as a consultant for the US news network. He is also charged with lying to the CIA in order to publish a book, entitled The Reluctant Spy: My Secret Life in the CIA's War on Terror. Mr Kiriakou was an agent with the CIA between 1990 and 2004. "Safeguarding classified information, including the identities of CIA officers involved in sensitive operations, is critical to keeping our intelligence officers safe and protecting our national security,'' US Attorney General Eric Holder said, calling it a "solemn duty" not to reveal classified information.